After completing my Bachelors in Engineering, I decided to pursue my Master’s abroad. Choosing to further my education overseas meant I would have the chance to experience an international environment and develop myself. I attended an Education in Ireland fair in Mumbai out of curiosity and was impressed by the plethora of compelling courses and campuses offered in Ireland. These Education in Ireland events are a major highlight and helped me to make my decision. It was during this event that had the chance to meet the lecturers and staff from the universities and during my second week at NUI Galway, I met one of the professors who guided me during the fair. Thanks to the guidance from the university representatives, I applied to various Irish universities. For Postgraduate students, the Postgraduate Application Centre (PAC) is the portal which will be the central point for most of the university applications. You can create your application all by yourself, with pre-requisite documents listed on the PAC as well as the university website. Depending on the university and course, you may have to pay application fees online. The Irish universities have a reputation of taking a decision about offers in a short space of time. I received my offer within a month. Although, I waited for few other decisions from other universities I had applied to also. After all the offers were in, I was stuck in a dilemma. Now I had an offer to study in Central Europe as well as from Australia and Ireland! This meant that a tough choice and when it comes down to studying abroad, the decision making can be stressful. I would advise the prospective students to speak to the industry experts, university alumni as well as your family to make sure your decision is the contemplated and cogent. I made an Excel sheet containing all the parameters which are essential in your education and rated each of the universities on these factors. This helped me to decide which course and university I should opt for. Some of the measuring factors I noted are duration, fees, overall cost effectiveness, living costs, part-time work and job opportunities. For me, NUI Galway led the pack in almost all these factors along with offering a dose of culture, high-quality education and excellent student services. This cleared my mind of doubts where should I study. One thing led to another, and I accepted my offer! Accepting an offer is pretty easy using PAC. Depending on the course and the university you might have to pay an ‘acceptance deposit’ fee in order to accept your offer and secure a place. This deposit is part of your course fee itself. If you require a visa to study in Ireland and depending on your native country, you may also have to pay to apply for a visa. For me, I paid €1,000 via PAC as the ‘acceptance deposit’ post which paid €5,000 as per the visa requirements and started my visa application process. My personal take away and suggestion to all prospective students is to start the visa processing as soon as possible. This will help keep stress levels down and allow for unforeseen circumstances such as resubmitting documents! Lookout for airlines which have student discounts as well as the higher baggage allowance for students. This will be a boon to you if you are moving abroad for the first time in your life. Try to arrive at least two weeks before the orientation, this will help you understand all the local systems, and most importantly find accommodation. I arrived 10 days before my course started and booked temporary accommodation via Airbnb for a week. 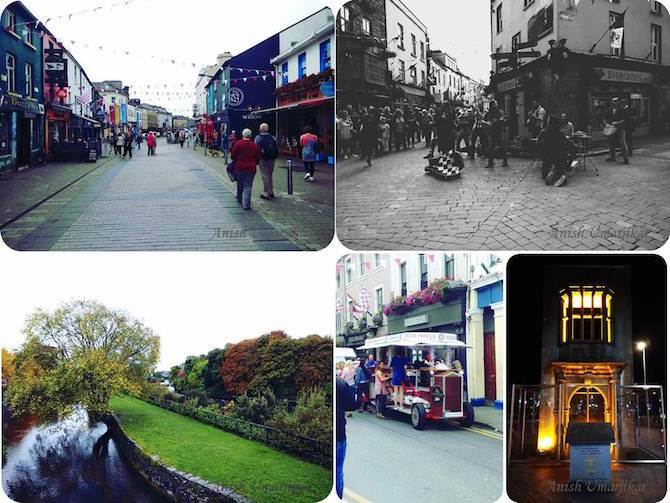 Everything in Galway is lively; one can feel rejuvenated just by walking the streets. People are kind and affable and Galway is a friendly city. Bus connectivity is very reliable and punctual, linking all areas of the city. It has been more than three months since the orientation week yet I still remember every part of the experience. This was the time I realised how lucky I was to have chosen Ireland for my education and NUI Galway as my university. During this week, you have the chance to explore student services; take part in activities; tour the campus and discover societies and sports clubs. This week is the best time to make new friends, explore the university and get excited for the days to come. NUI Galway truly respects its students and does everything possible to take care of them. There are even counsellors who help students overcome any problems they have. This is the first time that I have seen a university caring for students to such an extent. The chaplaincy service supports and guides students who need spiritual help (for all religions). The international office is one of the most important places if you are an international student. They are an awesome bunch of people, who will help you with absolutely anything — from opening a bank account to a Schengen visa! The university constantly fosters innovation and originality. This helps us to be open to our ideas and Blackstone Launchpad act as a platform to materialise them. 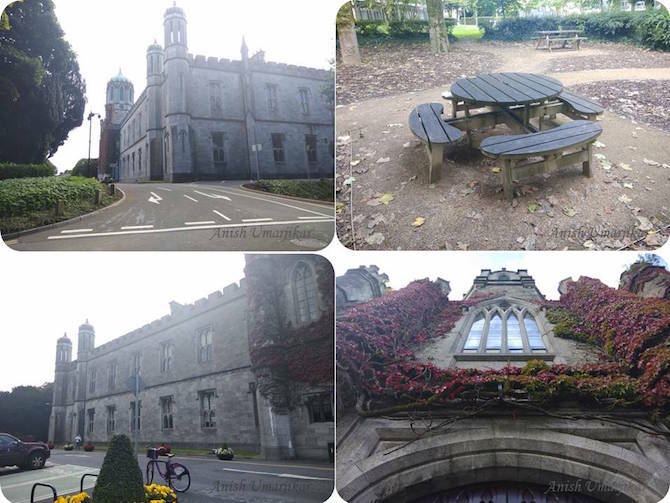 If you wish to study in an environment where you want to develop in each of the verticals in your life, NUI Galway is the place for you. My business school had arranged a small orientation for all the management students to help us understand how the semester worked. I was really excited to learn under such a great team of professors. This orientation was very specific for our course and prepared us for the classes about to come. As an icebreaker, the school also arranged dinner for us in a nice restaurant at the city centre. It was great to meet my classmates and professors in a relaxed social setting before classes began. The course of MSc in International Management is one of the best courses offered by the Cairnes School of Business, NUI Galway. It has been awarded the best Postgraduate Course (Business) in Ireland in 2013 and made it to finals in 2017. I find the course very interesting and subjects like Global Business, Human Resources, International Cross Culture and Strategic Management offer real insight into the industry. All the professors are approachable and happy to help — each bringing their unique style and experience to the class. This makes it interesting and easy to grasp the concepts. I cannot measure the wealth of knowledge I have gained in just three months of classes, which excites me for the times to come. Irrespective of some hurdles faced for finding accommodation, I did find a lovely place not far from the university and moved in immediately. The University Accommodation Office helps students with everything including finding the right place to stay to guiding us about the do’s and don’t’s of renting. However, one can always to search for accommodation before you arrive, using the Facebook group, Rent & Daft. Interested in finding out more? Comment below if you have any questions about this amazing university, my course or about Galway. I’m happy to help! I have been just offered a conditional offer on my course provided in elar the Principle of marketing certification! Do you have any idea what the certification is and how I get it ? Also how are the part time job opportunities in Galway ? Please could you help me with more details about your course? I could not find anything called Principle of Marketing Certification. A URL to the course would help me. Regarding the part time, there are jobs here, but the competition is severe as its a student city. So one has to keep trying right from the day you arrive. I do not have the course URL for the Principle of Marketing Certification. Clearing this certification is a condition that I have to meet in order to join the programme. They Said they’d send me the details once I accept the offer. But anything more you can tell on the certification will help me. Or if you can point me to an alumni who has done/doing Digital Marketing course will be really helpful. Hi Anish, I have got an offer from NUI Galway for the Digital Marketing program & 7th Feb is the deadline to accept the offer but I am in the waiting list for the UCD program right now. Is there any chance that they’ll extend the offer deadline? Also, what you would have chosen between UCD & NUI Galway and why? UCD is indeed better ranked university. 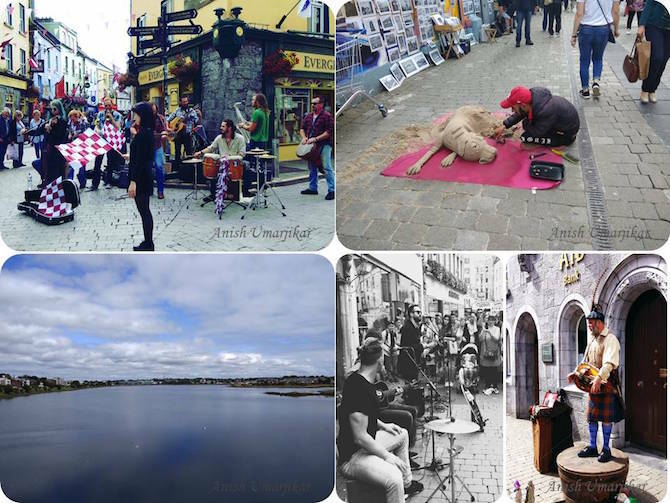 However, Galway is a cultural capital of Ireland, is vibrant and easy to live. Dublin is expensive on every front. My choice would be very subjective here, as you will have to chalk out the priorities and take a call then. Sole university ranking cannot be the deciding factor, you can consider cost of living, the student services, the course value in market ( this differs from Uni to Uni ). they will be able to help you with your query. Getting a job in Ireland is very subjective. It includes lots of factors such as experience, profile, relevance of experience, CV, etc. But there are jobs available here, its just about taking those efforts and applying for them. You can go onto LinkedIn and search for people who have completed the course, that should help you to know where the alumni is placed. Hello! Really liked reading your blog, I got an offer for this years master. With a background in cultural and literary studies I was wondering if you could tell me more about the material and the subjects. Is the material very dry? What are the main topics ? And also, how is the study pressure, is it a heavy master ? As it is only 2 times 4 months course? And for a non business student is it doable still having a social life 🙈? The courses cover variety of verticals like HR, Strategy, Finance, International culture, etc. I personally found the courses and more importantly the professors very engaging, hence never felt the courses to be dry. Although, one has to think critically and ask questions. As for the pressure, I think its not very heavy, if one attends classes regularly, and completes submission in safe timescales, one does not have to stay up all night. Its a one year course. Yes, it is ideal for non-business students as well, we have students who are from nursing background. hospitality background. It all adds up where you want to go after the course. Hi, i got conditional offer for the course Business Analytics http://www.nuigalway.ie/courses/taught-postgraduate-courses/business-analytics.html and the deadline for acceptance is next Friday, I’m waiting for the offer from TCD and UCC, what shall I do? Well I about to pursue master in management from Ireland, but I’m bit confused which university to select. Greeting for the new year ! I have been wait listed for data analytics course at NUIG Galway. Does the waitlist move by any chance.What are my chances? I applied on 30th Nov, received waitlis mail on 17th of Dec. I have no offer from any other university in hand either,hence the decision really matters ! Has your Status moved from waiting list by any chance?